Text & photographs copyright © 2009 by John Northall. Above: The castle motte from the north-west. The remains of the small motte and bailey castle of Castell y Bwch (Buck's Castle) lie near the church in the centre of Castlebythe village. It's a sort distance below the iron-age hilltop stronghold of Cas-Fuwch and is midway between the neighbouring castles at Henry's Moat and Puncheston. Castlebythe is at the eastern extremity of the Barony of Cemais and the castle was probably built by the Normans to help control their newly seized territory in the early 12th century. The Episcopal register of 1493 called the place Castellbergh (burgh is an old English word for a fortified town) and in 1513 Castellbugh. Castlebythe is likely to be a further mutation of the name. The castle mound, or motte, is around 20 feet high with a diameter of 40 feet at its top. Digging has disturbed the sides of the motte and the ditch that once surrounded it has been filled in. 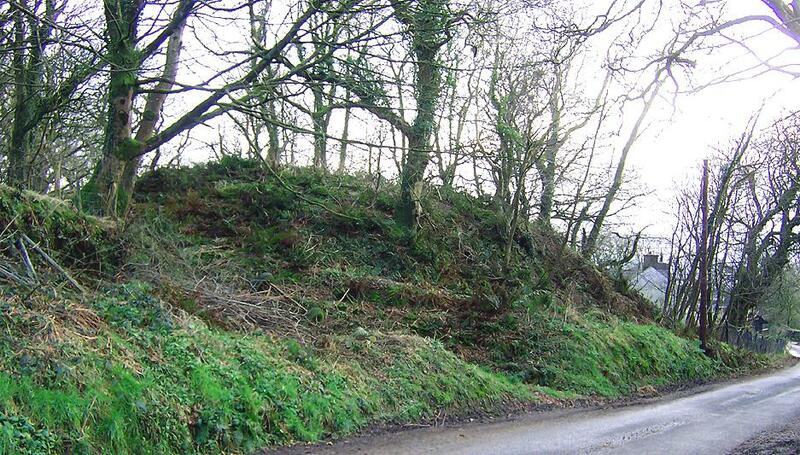 According to the Pembrokeshire volume of the Royal Commission into Ancient Monuments in Wales, dating from 1914, an oval bailey stood to one side of the motte and measured 220 feet by 170, with banks that were 12 feet high from the bottom of its ditch. It had a freshwater spring within its northern bank. This is probably the banked enclosure to the south-east of the motte, which is currently being used as a farmyard. The siting of the castle is unusual in that it's overlooked by higher ground and does not control any obvious features such as a river crossing, but this could be explained through the re-use of an earlier structure. The bailey may have been one of the hundreds of earlier circular earthworks, known as raths, that are scattered throughout Pembrokeshire. This would have provided a useful starting point when building a minor castle, especially as it had its own water supply.